Of course, then I couldn’t decide which print I wanted to use, so I decided to use them all. At the time it seemed like a good idea, though now that I have 4 sets of pillowcases, I’m wondering if perhaps that was overkill. Variety is nice, right? I used my pillowcase tutorial, and was amazed once again how quickly they come together! I’d say I see more of them in my future, but seeing as how I now have 8 new ones, I guess we’re good for a while… now I may have to be on the hunt for some new sheets to match. This entry was posted in Household Goods and tagged Fabric, handmade, laura gunn, pillowcases, poppy, tutorial. Bookmark the permalink. OK, that does it. I’m adding pillowcases to my “to sew” list! These are just too gorgeous! And thanks for the wonderful tutorial! Just recently found your blog and was immediately hooked! You have such a great eye for colors, prints, etc.! LOVE them! I made flannel pillowcases because of you and loved them. Great idea for a large print. So pretty! Love how they look all lined up and hanging on the clothes line. This would brighten up any room. They are beautiful! What a great use for big prints! Those are SEW cute……I love the poppies and the fact that they don’t all quite match, but when paired together they’ll make a great spring/summer redo for linens in the house….now all you need are some fresh linens to go with them….either light sky blue or the sage green color. OH my gosh they are gorgeous!!! That does it, i MUST get some of this fabric! LOL!! What a great idea ~ new spring/summer time pillow cases:) Thanks for the idea. 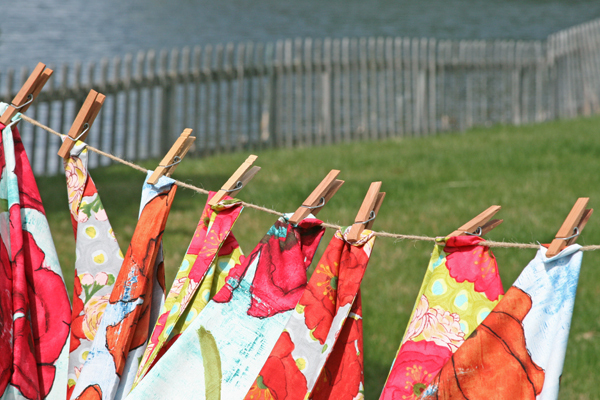 I love the pictures of the pillow cases all lined up hanging on the clothes line, very inspiring. 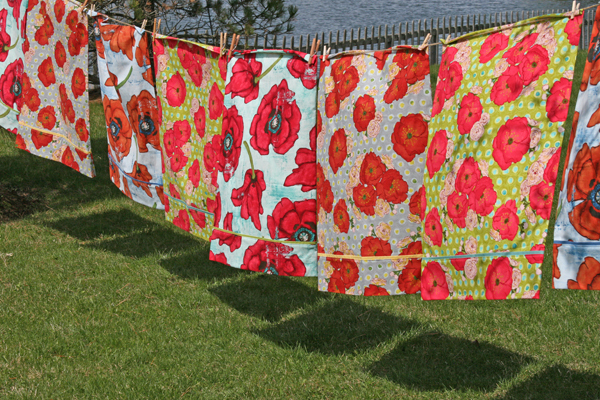 If you find that eight is too many, you could send some to me… the Poppies fabric is perfect for bed linen. Laura Gunn is amazing. Oh, those are gorgeous! Just the thing I need to spice up my beautiful solid cream quilt… Thanks for the inspiration!! these are so pretty! i would have had to set up a lounge chair and have a tall glass of lemonade while these hung on the line. i am inspired! Breathtaking! I love the poppys and think you had a great idea with pillow cases! Thank you for sharing! so very pretty! recently, i am so infatuated with poppies! OMG! Those are so freaking fantastic! I think I might like the photos as much as I like the pillowcases themselves (though I was looking forward to a different kind of photo shoot 🙁 ). Also, I think 8 is a great number – you can keep swapping them out without having to also do a wash. Not that you’re that lazy…but I certainly would be! Wow, those are so pretty! And I have to say that I am incredibly jealous that you have a clothes line. We’re not allowed to have one where I live. Utterly, utterly gorgeous. Can you imagine if there were duvet covers too? i don’t have any of these fabric, but i think i need to get one of each now! they are surely pretty and i can just picture them in my room with other stuff. thanks for sharing~ loving your blog very much! GORGEOUS! 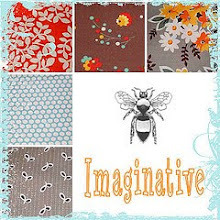 I absolutely love these fabrics! Bravo! LOVE LOVE LOVE! Hmmmm, I might add a little poppy to my in-progress guest room. the pillowcases are beautiful ashley but the photography is excellent. love these pics! OH my goodness they are stunning !!!!!!!!!!!!!! !good use of fabric …. oh, i LOVE them!! the fabric is so perfect for spring pillowcases!! Oh, wouldn’t it be cute to sew a little matching trim on a cotton sheet set! Lovely pillowcases, by the by. OMG! These are beautiful. It made me want to go online and buy some more Poppy fabric. I love what you’ve done with this fabric. wait a minute….you live on a lake? 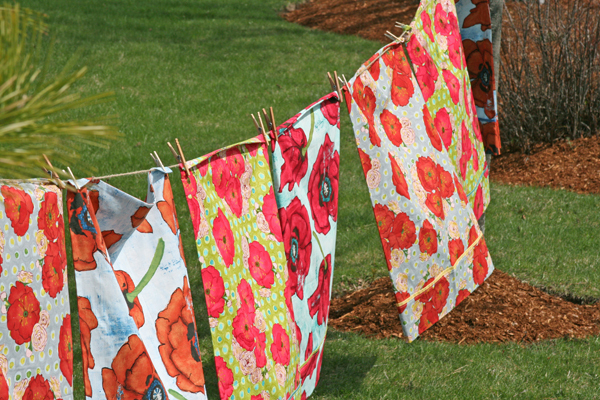 the pillow cases wouldn’t look as pretty on a clothesline in my still-dead-grass back yard. winter stinks. They look lovely Ashley. I notice you have nice new clothes pins. Why not try out my clothes pin bag/tidy pattern? 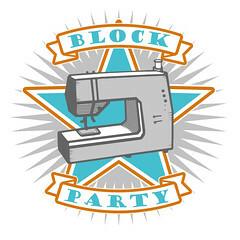 It’s free on my blog and I’ll love to see what fabrics you use. Oooops. Sorry I misspelled the url of my own blog! I’ll get it right this time. Lovely! I have seen a few bags made out of that print, equally as gorgeous. The pillowcases… the photos… both amazing! I can just see those gorgeous pillowcases against a white quilt or duvet – stunning! Sheets in the palest of blues… So pretty together. Why stop when one set looks so beautiful? I love them all! Great idea to find sheets to match too. These would make me so happy to go to sleep! 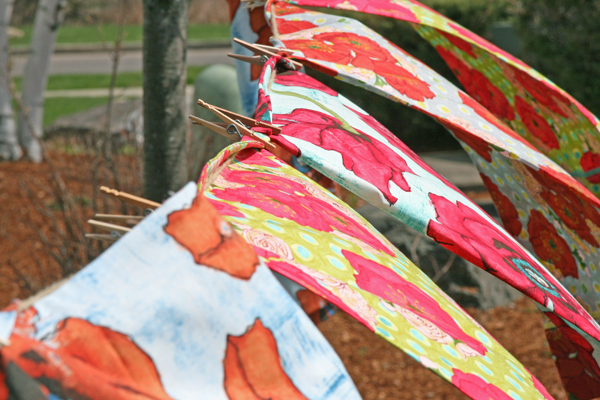 Those pillow cases will not only brighten up spring and summer but also for winter (but that is a long wait). Solid bedsheets will look great with these pillow cases. Now I am tempted to make some of my own (as if I have not enough things to do). Your pillowcases are way too cute with that poppy fabric! When I was in Home Economics (several) years ago…and we wont say just how many years.. :)… We learned to make these pillowcases…The french seam is the cats meow! We made them in the tube method so the topstitching step was left out of ours but they all still turn out the same way. I have actually sewn up several in the last week with kid friendly cat and dog fabrics. I will be posting them on my blog this week. I also wanted to say that I think you use the coolest fabrics in your quilts! Those are AWESOME. Gotta get me some of those. I have some Kaffe prints that would make great pillowcases too. See how inspiring you are!! They would be lovely with a white duvet or quilt (with maybe a bright binding) and maybe a bed runner to match!! Better go dig some fabrics from the stash whilst I’m motivated………….